Copper is an essential nutrient for the body. Together with Iron, it enables the body to form red blood cells. It helps maintain healthy bones, blood vessels, nerves, immune function, and contributes to iron absorption. Sufficient Copper in the diet may help prevent cardiovascular disease and osteoporosis. One of Copper’s primary roles is to help form collagen, essential to youthful skin. Copper is also needed for hemoglobin production that is essential to all healing mechanisms in the body. Being deficiency in copper results in skin pigmentation problems. Lowered hemoglobin levels lead to poorly formed red blood cells and conditions such as anemia. In addition, Copper is an antioxidant that helps prevent free radical damage. Slows Aging - Copper is a powerful antioxidant that protects cells against environmental and age related free radical damage. Copper can help reduce the appearance of wrinkles and age spots. Copper is important for eye health too and can even help prevent macular-degeneration. Copper works with zinc to help prevent greying. Brain Health - Copper is important in brain health. Copper rich foods stimulate mental functions. Copper is a “brain food” because it helps enable certain neural pathways that promote thought processing and creative thinking. A lack of copper during growth may result in learning disabilities, stunted brain and nerve growth and development. High Copper foods stimulate higher-level thought processes and mental functioning. It has been called a “brain food” because it helps enable certain neural pathways that promote out of the box thinking. A lack of copper during growth may result in incomplete brain and nerve development. Therefore, copper is also important in the prevention of age-related brain conditions such as dementia and Alzheimer. Cell and Tissue Energy - Copper plays a role in the synthesis of adenosine triphosphate (ATP) an enzyme important in anti-aging that helps keep our tissues firm and toned and ATP is also the primary molecule of energy storage in our bodies. A copper deficiency can cripple the mitochondria, the cell energy producers in the body. Without copper the mitochondria is unable to adequately produce ATP thus creating a cascade of cell function errors that can make you feel lethargic and tired that becomes more prevalent as you age. 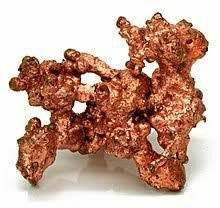 Copper helps us utilize iron and protein more adequately which in turn helps reduce age related weakness and helps us feel stronger with more energy. Copper helps fight anemia, making blood cells stronger and helps prevent fatigue. Other, Copper deficiency symptoms can include arthritic type chronic pain, stiffness, aching joints, lowered resistance to infections, and a general weak feeling such as from anemia and low-grade infections like leaky gut. Drink To Your Health, to ensure you’re consuming Copper daily.